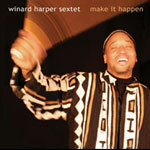 Veteran drummer Winard Harper (who has played with Dexter Gordon, Johnny Griffin, Betty Carter, Ray Bryant, Abdullah Ibrahim, Pharoah Sanders, Clifford Jordan and others) gives us two albums in one on Make It Happen. The first is percussion-heavy. The opening tracks, for example, present an approach to ensemble sound that recalls Mosaic-era Jazz Messengers (carefully arranged multiple-horn lines over a busy, insistent rhythm section). The best compositions echo episodes in the Mingus lineage (notably Dave Holland's excellent mid-'80s groups). These elements can be traced back to a common ancestor in Duke Ellington, and you can't have better roots than that. These musical elements are held together by a genuinely novel mix of Afro-Cuban and unhyphenated African percussion. The percussion draws upon the more familiar Latin rhythms known to jazz audiences since Dizzy Gillespie invited Mario Bauza into his band (witness the flawless Latin jazz marriage in Harper's treatment of Charlie Parker's "Segment"), but also other West African elements which are distinct from the more familiar Yoruba heritage: most notably the invigorating Senegalese talking drum passages on "Children of the World." Three nearly all-percussion numbers are a special treat, especially the title track, from Wycliffe Gordon's didgeridoo prelude to its organ-drenched finale over a Brazilianesque rhythm. The other album is a relatively crammed set of decidedly mainstream allegro ma non troppo jazz; more than a few numbers have to be faded out long before they've worn out their welcome to make room for the others. The locus of inspiration for this second part fluctuates between the '50s ("I've Never Been in Love Before ) and '60s ("Chronic Mistakes, the bass/alto duet "Tamisha ), and the added percussion is either inaudible or unobtrusive (and always appreciated, when you can hear it). It manifests the same great Duke-ish approach to group sound. 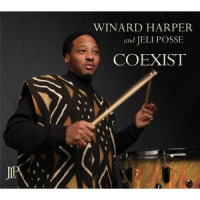 Harper assembles a spirited ensemble, augmented on the best tracks by an idiosyncratic band of supplementary percussionists, who play with a palpable joy and solidarity. 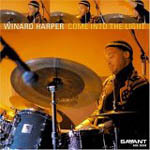 The percussionists, beginning with Harper, lead the pack; trumpeter Josh Evans' brassy (as opposed to airy) tone recalls Lester Bowie (and ultimately, Rex Stewart) and deserves special mention, but then so too do guests Antonio Hart (alto sax) and Lawrence Clark (tenor sax). I could listen to the numbers on the percussion-heavy part again and again. As for the cuts on the "second" album, they offer fewer reasons to return for more (with the exception of "Divine Surveillance, which has a certain gravitas). If the balance between the two had been struck more decisively in favor of the first, this would be a stronger overall release, and there is no doubt in my mind that these players could have sustained the passion of the percussion-based group over nearly eighty minutes. As it is, the unflagging excellence of the compositions, arrangements and soloing (that's just about everything on a jazz record, isn't it? ), added to the evident camaraderie of the players throughout, make for a strong and joyful entry under the "soulful/mainstream heading.